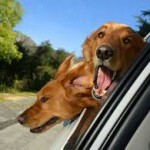 You’ve seen those dogs riding in cars – head stretched out the window, ears flapping in the wind and an expression of pure joy on their face. Yet your young dog has to be physically forced into the car and once inside is a drooling, barfing picture of misery. 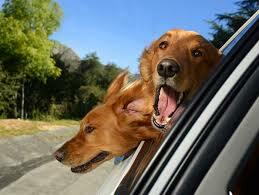 Car sickness can be a common problem for puppies and young dogs. It may start off as motion-related but can quickly become a more complex issue as a pup associates the car with feeling lousy and starts to feel stressed about even getting in. If your only car trips to date have been his first one home and then to the vet (both potentially stressful events), he may feel even less enthusiastic about getting in. Ensure that Rover is facing forwards and can see out. I’ve even heard of some people using an Elizabethan cone to block out peripheral vision. For smaller dogs, booster seats can help secure your pup while propping him up to window height. If you choose to put him in the front seat you should disable the air bag or at least move the seat as far back from the dashboard as possible. Try a different car in case the association is with your vehicle specifically. Keep windows open for fresh air and to equalize pressure. 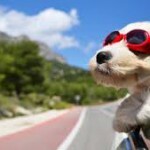 It is not actually safe for your dog to stick their head out the window (bugs and flying debris can cause eye injuries) but if it makes them feel better ensure that they are securely harnessed and invest in a pair of Doggles to protect their eyes. Yup, they make goggles for dogs and they are pretty darn cute. Ensure that Rover has had no food or water for 2 hours prior to the ride. Talk to him cheerfully while driving and point out sights of interest. This may sound silly but could help him get his mind off his troubles. If he’s willing to eat, offer him favourite treat or two. Not too much or you’re back to barf-city. If he refuses to eat he’s telling you that he is still pretty miserable. If he has a BFF of the canine variety who loves car rides, bring his bestie along for moral support and to show him how fun a car ride can be. Teach Rover some new fun associations in very small doses as follows; keep in mind that you may have to repeat each step many times before moving onto the next one. Rover will set the pace, just make sure he looks relaxed and happy before adding step. Go out to car with your pup and just play some ball and offer him some treats around it. Invite him into the car and offer a few treats or play for a minute or two and then get out. Avoid luring or coaxing him into the car with food or you may end up with a dog who is suspicious of food in general in case there are ‘strings attached’. Repeat above and turn the key in the ignition. Play and jolly talk with your little guy for a minute or two without going anywhere before exiting the car. Repeat above, now back out of driveway and return. Repeat above, adding maybe a trip to the neighbours house or around the block. 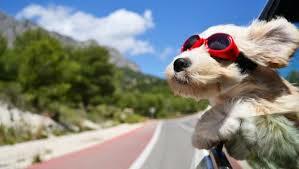 Gradually build up longer drives and try to make the destination fun for your puppy as often as possible. You should be practicing this for a few minutes at least 2-3 times per day. Each time, you start; warm him up by starting at step 1 as opposed to picking up where you left off, only now you only need to do one or two repetitions before going to the next step. You may need to give your pup a break from longer car rides for a week or two while you work on this. If all of this doesn’t help remedy the problem over a few weeks you should discuss anti-nausea medications with your vet. Keep in mind that if the underlying issue is a stressful association, the medication will only relieve the symptoms. Good for your upholstery but not good enough for your puppy, you’ll still want to work at turning that puppy frown upside down when he sees the car!